Ok the secret is out...well it wasn't much of a secret I guess. The kind folks over at Fujifilm Canada has graciously loaned me the all new Fujifilm X-E1 with the standard kit lens for review. I have 3 pages of notes so far, and I'll put together either a short preview or a full review in the next week or two. What I can say about my testing process is that it will be more like Luminous Landscape and not like DPReview. I don't care about pixel-peeping or a run down on every single feature and how fast or long things take in milliseconds. As a camera nerd I don't mind knowing those things, but I want real world tests, not what it can do in a lab or a very controlled environment. Don't you find that you skip to the end of a DPReview 20 page camera test to the "conclusion" section anyway, since that's what counts the most: the opinion of the tester? I want to know what the reviewer thought about the camera, how it felt in the hand while they walked around, how quickly they could change modes or find the functions they use the most. I want to know how the shutter button feels, how the dials click, how smoothly the lens focuses or zooms. Moreover, I want to know if the reviewer struggled with the camera, or did it become an extension of their eyes and hands. So what am I looking for in a street-shooter style camera? If I wanted absolute resolution and image quality, I would be shooting with a 8x10 Horseman monorail camera, but that's not the highest priority for me as a street photographer. I guess it's all subjective, but I can tell you one thing I'm looking for: compact size and weight. I have a beautiful DSLR and some really nice lenses, but I don't want to drag these things around all day. The Fujifilm X-E1 definitely fits the description of compact size and weight. That's all I'm going to say for now. Please wait for my review coming up soon. I may post some pictures with the X-E1, but it won't be a review of the camera itself, but just a regular post. Ok, time to go out and take some pictures!! Don't forget to follow me on Twitter or subscribe via email, or just bookmark me!! Thanks. P.S. 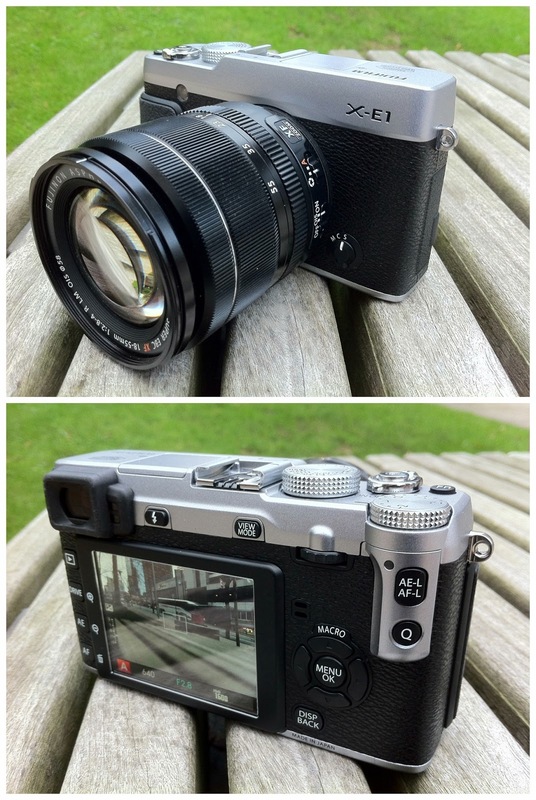 I took these pics of the X-E1 with my iPhone 4 in HDR mode. Remember, your best camera is the one you have on you. Thank you Steve Jobs for a great tool. Affinity Lo Pro Bike Frame & Kevin Bacon?